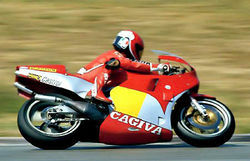 The C10 is a competition motorcycle made by the Cagiva company, which participated in the motomondiale 1985 and 1986. The motion to adopt the first time an engine V4 90 ° to two crankshafts and counter-power to strip (instead of the rotating discs of earlier versions), also uses an aluminum and no more a Tubular and front calipers with four pistons and two more, the motion received little success, although at the end of the year 1985 was made to prove Kenny Roberts, which obtained excellent results, in 1986, the motion type changes of circles, which are three races for both circles and no more than five races, also the brake calipers are moved from forward to back the sheaths of the forks. The bike in '85 was raced by Mark Lucchinelli and Virginio Ferrari without obtaining important results, whereas in 1996 Juan Garriga was hired instead of Virginio Ferrari, which endded in 17th place, the best position ever attained by Cagiva until then.